Grinding your own hamburger meat is the way to go. Photo by Donna Turner Ruhlman. Donna and I are on assignment in Italy and France. In the meantime, don’t forget that Salumi is coming out next month! Yes, I still buy ground beef occasionally, but when I want to make a really good burger, I always grind the meat myself. Why go to the trouble? For a half a dozen reasons, all of them important. First and foremost: taste and texture. When you grind your own, you can regulate the amount of fat you include; your hamburger should contain 20 to 30 percent fat for a juicy, succulent burger. I can season the diced meat before grinding it so that the burger is seasoned uniformly throughout. And I can use the large die so that it’s got real bite to it. Importantly to me, when I grind my own, I know it hasn’t been contaminated by any of the bad bugs that can get into ground meat these days at big processing facilities, or even through carelessness in the meat department of my grocery store. 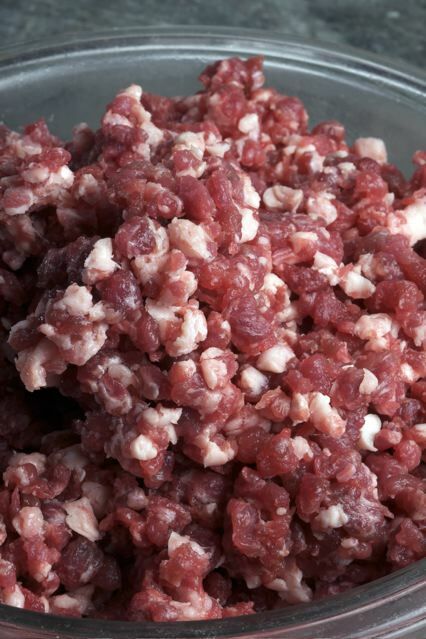 Provided I give the whole muscle a thorough rinse and pat it dry, I can eat the ground meat as tartare or serve it to my kids as rare as they want it. Big question: Is the cut critical to the final burger? Not as critical as the ratio of beef to fat. Beef is beef and, unlike pork, beef tastes like beef no matter where it comes from on the animal. I know people will disagree. I’m a co-author of two cookbooks coming out this fall, Ad Hoc At Home and Michael Symon’s Live to Cook, and both include hamburger recipes that recommend specific cuts. The chefs involved have tasted various blends and insist there are marked differences. I believe the only critical ratio is the meat to fat, so I buy a nice, fatty, relatively inexpensive chuck steak, and that gives me a great burger every time. Short ribs will give you a great burger as well. So will sirloin and brisket if you’ve got the right amount of fat. The large die is critical to good texture and bite. I want to be able to chew my burger, not have it fall apart in my mouth or be too dense. I send the meat through the grinder twice. Why? To make it sticky. The second grind develops the myosin protein, which helps the meat stick together without your having to overwork the meat. I want a light burger, not a heavy one that’s been kneaded and squeezed to death. One last point: Just as with sausage, it’s very important to keep the meat very cold all the way through shaping, which helps to ensure juiciness and a good texture. After that, the only thing left to do is cook it right. I think they’re best cooked over very hot coals, a few minutes per side, then removed to the cool side of the grill and covered for a couple minutes more, then rested for about 5 minutes. Serve with fresh tomatoes and lettuce, with melted onions, with a fried egg on top. Put some homemade potato chips beside a freshly grilled burger you ground yourself for a fantastic, simple, satisfying meal. My post on the Prescott Frost Organic Beef Venture. Bone Marrow Burgers are Emilia’s favorite custom blend burger in Chicago, made by Chef Rob Levitt at The Butcher & Larder. Butcher and Baker carries some neat shirts with a meat theme, plus some home wares too. Serious Eats is serious about their hamburgers. Do you salt the meat for a burger? My brain is too fried at the moment to remember where, but I just read somewhere that the salt also helps “rough up” the meat a little and helps the burger texture. I tend to salt everything so I’m not sure I’ve ever gone without to know the difference. I know you didn’t ask me Carly, but I salt the meat. I add about 14g salt per 1000g meat before I grind. That helps it hold together, enhances moisture retention and, of course, it improves the flavor throughout. I never thought to salt it before grinding. Gah, so obvious. Will do this going forward. Interesting. And do you salt it just before grinding? Rather than just salt, my husband likes to use a steak rub – it’s fantastic. Then I handle the meat very carefully when shaping patties. Been grinding my own meat since the day I inherited a meat grinder. First book purchased after that was Charcuterie. Haven’t ever looked back. Lately, I have been playing with different combinations of cuts trying to find the “house blend.” I salt the burgers as they come to room temperature. Interesting idea to add it to the grind. This time of year, I skip the potatoes and go straight for corn. Such a short season, I feel it is my American duty to eat as much local corn as possible during these precious weeks. I never ever season the inside of a patty. If you salt the meat, you cannot work it (like sausage) after it is ground because the salt enhances protein fiber binding. 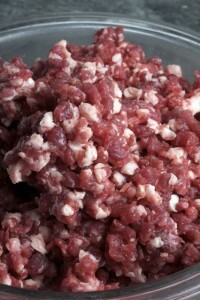 In other words, when you salt burger met prior to grinding you need to treat the ground meat very gently. Otherwise it tightens up -as in the Serious Eats post- and you get a burger that is too homogeneous and tough. Of course, like all things culinary the “right” way to do is the way that you like best. Michael, since we’re on the topic could you re-post your note on grinders from a year+ ago? I seem to remember you weren’t a fan of the KitchenAid grinder attachment. I totally disagree with putting a fried egg on a burger.Where did this ludicrous practice start ? It started with people who think fried eggs taste good on a hamburger. It think it’s great, but if you don’t like it, don’t do it. It’s no more ludicrous than putting ketchup on a burger – it’s just a topping that some people like and some don’t. I find the best burger comes from a flat-top, not a grill. Better yet, throw a cast-iron pizza stone ON your grill. Add your burgers after the pan is scorching hot. Do not add oil/fat. Let the natural fat of the burger render as it cooks. You will develop much better crust formation and lose very little of the precious fat since it’s not dripping down into the grate. Eggs as a garnish are not new, and one of a host of myriad application in the kitchen. If you look at the hawaiian loco moco it’s rice, with a hamburger, then a fried egg, and doused in brown sauce. I’m sure it’s delicious. To each their own. @Bob: You need to fix the url in your profile, no www at the beginning. 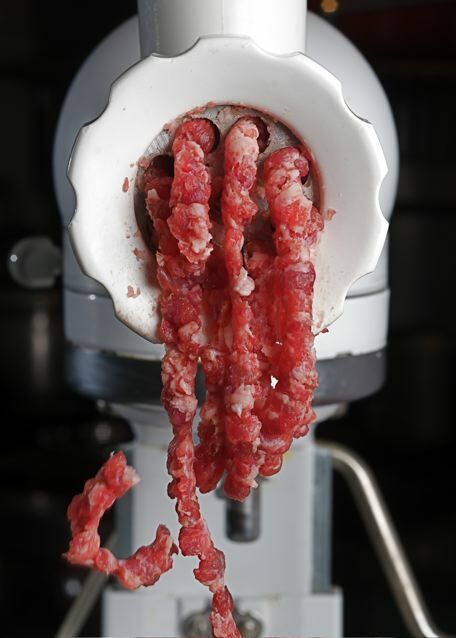 I have never ground my own beef for burgers, but has anyone tried the (I believe Heston Blumenthal) technique where you carefully array all the strands of meat as it comes out of the grinder, wrap it like a sausage and crosscut it? It does sound intriguing. Little late here, but the guy from the blog A Dork and His Pork just recently wrote about making the Blumenburger, really good write-up. You should check it out! I got some grass fed ground beef as part of a meat order. Works great in other things, but awfully dry in a hamburger. Any ideas on how to add fat,what kind, etc…? Trimmings from just about any other cut would work. Grind the fat trimmings, ice cold, and mix in with your ground beef. You may have to just eyeball it to get a good percentage, unless you already know the fat % of the ground beef, in which case you can just weigh and do a little math to figure out the right amount to get to the % you want. What works best for me is to put the stuff you are going to grind into the freezer until it just starts to get hard, then grind. Especially true for the Kitchen Aid grinder attachment, which struggles if the meat is too soft/warm. PIEMONTESE BEEF,GRASSFED FROM BIRTH AND CERTIFIED ORGANIC IS NOT ONLY HEART HEALTHY WITH LESS FAT AND CHOL. THAN SKINLESS CHICKEN BUT SATURATED WITH OMEGA 3’S TO BOOT, IT’S MORE THAN WORTH ITS PRICE, (ACTUALLY SELLS FOR LESS THAN THE ”NATURAL” CLAIMED FARMERS SELL THE CONVENTIONAL SALE BARN FEEDERS TO THE LOCAL FOODS FARM MARKETS’ FOR,call me i’ll prove it,….COMPARE OUR PRICES) WITH TASTE AND TENDERNESS ,WHILE COOKING IN HALF THE TIME OF CONVENTIONAL BEEF,IT’L BE ALL YOU’LL BLOG ABOUT…….MANNAFARMS.COM and were local too, michael!!!! PIEMONTESE BEEF,GRASSFED FROM BIRTH AND CERTIFIED ORGANIC IS NOT ONLY HEART HEALTHY WITH LESS FAT AND CHOL. THAN SKINLESS CHICKEN BUT SATURATED WITH OMEGA 3′S TO BOOT, IT’S MORE THAN WORTH ITS PRICE, (ACTUALLY SELLS FOR LESS THAN THE ”NATURAL” CLAIMED FARMERS SELL THE CONVENTIONAL SALE BARN FEEDERS TO THE LOCAL FOODS FARM MARKETS’ FOR,call me i’ll prove it,….COMPARE OUR PRICES) WITH TASTE AND TENDERNESS ,WHILE COOKING IN HALF THE TIME OF CONVENTIONAL BEEF,IT’L BE ALL YOU’LL BLOG ABOUT…….MANNAFARMS.COM and were local too, michael!!!! “Serve with fresh tomatoes and lettuce, with melted onions…”. I know that modern cooking techniques probably have a method for doing this but did you really mean to melt the onions? I would suggest that the fat content is a matter of personal preference, and that there is no correct ratio or required degree of juiciness that fits everyone’s tastes. I tend to lean towards the lean – in fact sometimes make burgers from ground grass-fed bison, which is lean beyond belief, but still makes a superbly tasty item – with some blue cheese and arugula; yum yum. 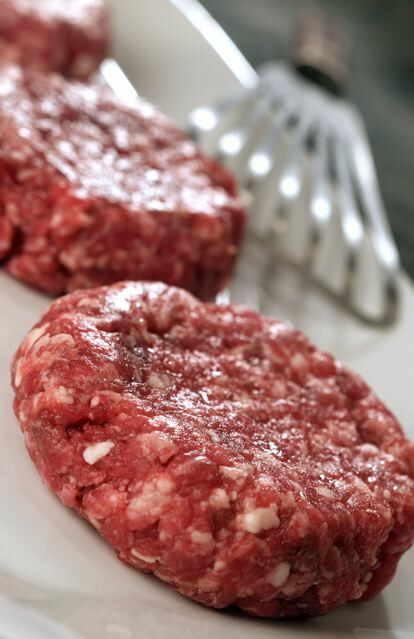 Agreed – I do like a burger with a higher fat content as well, but when I make burgers from leaner grass-fed meat, I’m just extra-cautious about keeping them medium-rare. More fat does make it a bit more forgiving, though… especially if you’re doing a lot of grilling and aren’t so great at multitasking. I’d like to start grinding my own meat, too, but don’t have a grinder/stand mixer (no space in my toy kitchen!). Could you do this in a food processor? Great blog! not really, you don’t get the same texture.